Back in 1990, my late husband taught classes on the beauty of sacred geometry. He believed if one is to come into resonance with the universe, one must be able to accurately visualize the dance of Platonic solids and know how they fit and transform into and out of each other. Coming into congruence with sacred geometrical shapes and knowing how to visualize them at will is great knowledge sought after by those in the know. In esoteric circles, the novice must appreciate the profound relationship between sacred geometry and the proper creation of a magic circle. For my husband’s classes, I created all his hand-outs, including ton sacred geometry. For his publications, I created educational illustrations exemplifying the concepts of sacred geometry. The above illustration is the first page from our chapter on sacred geometry [“The Ophanic Revelation” (c 2006)]. 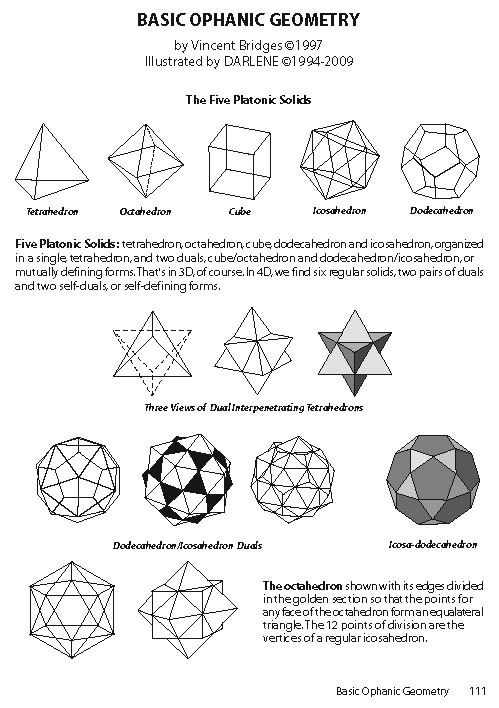 The classic five Platonic solids are 3-dimensional polygons that have a sequential relationship to one another (known as duals or congruency). Congruency occurs when one polygon–with its unique shape, size and facets–can be transformed into the next polygon simply by changing it’s placement by flipping or rotating them. The five Platonic solids are the tetrahedron, cube, octahedron, dodecahedron and icosahedron. Goethe once wrote, “geometry is frozen music.” What an beautiful way to describe the elegance of these patterns. Because of my familiarity with sacred geometry, I was fascinated to encounter a client, from the unusual venue of gaming, who was conversant with the Platonic solids. In his text, he addressed the five Platonic solids and supplied an illustration of the same. I wondered to what degree he was acquainted with the forms. In my role as his book’s designer, I expanded on his seed idea. Instead of all the solids appearing at once in a single chapter head, I assigned one geometric solid to each chapter in the book. As there are only five solids, I had to add an additional polygon for chapter six and chose a star-tetrahedron. To pique the interest of the inquisitive, I added a small splice of text revealing the symbolic meaning represented by each Platonic solid. The fourth chapter details life in the game world created by author, Joe Aragon. Representing spirit, I wrote about how the dodecahedron, being “an expression of life and consciousness,” is inherent to the stage of becoming self aware. The icosahedron reflects the magic and monads of chapter five. Associated with the element of water, the icosahedron is about expression and “going with the creative flow.” After awareness of one’s self comes the awareness of others. I assigned the star tetrahedron to the final chapter six. Although not a Platonic solid, the inner penetration of two tetrahedra is representative of the dynamic between two opposing forces. Appropriate because, among other things, the chapter introduces the monsters which are likely to be encountered. In my introductory illustration for chapter two, I visually suggest a relationship between sacred geometrical shapes and polyhedral dice, inferring a symbolic relationship exists between the divine and the mundane. The energetic dance that occurs between the specific shapes is inherently beautiful. Like nature, these patterns have a soothing affect on the psyche and evokes a sense of the familiar (which promotes well-being). A beneficial vibrational resonance is established between sacred geometry and those who would fix their gaze and meditate upon the forms. Being in close proximity to sacred geometrical patterns often inspires feelings of being deeply and divinely connected. This resonance powerfully indicates that sacred geometry acts as a universal language capable of crossing multiple dimensions, uniting life forms. Thus it is that we find our place within the divine blueprint of the cosmos … however how large or minute. This entry was posted in For the LOVE of BOOKS, The Creative Process and tagged congruence, cube, darlene, dodecahedron, gaming, icosahedrons, Mythos Arcanum, octahedron, platonic solids, Sacred geometry, star tetrahedron, tetrahedron on August 8, 2015 by Darlene. Thanks for sharing this great article, this will help people for sacred geometry initiation.